Ogham stones are among Ireland's most remarkable national treasures. These perpendicular cut stones bear inscriptions in the uniquely Irish Ogham alphabet, using a system of notches and horizontal or diagonal lines/scores to represent the sounds of an early form of the Irish language. The stones are inscribed with the names of prominent people and sometimes tribal affiliation or geographical areas. These inscriptions constitute the earliest recorded form of Irish and, as our earliest written records dating back at least as far as the 5th century AD, are a significant resource for historians, as well as linguists and archaeologists. Seminal work has already been carried out on Ogham inscriptions, most notably by Damian McManus (Professor of Early Irish, Trinity College Dublin and author of A Guide to Ogam) on the linguistic aspects and by Fionnbarr Moore (Senior Archaeologist, National Monuments Service) on the archaeological perspective. To date, the Ogham inscriptions have been recorded using drawings and conventional photography. Tribute must be paid to the pioneering work of R.A.S. Macalister who produced line drawings of remarkable clarity in his Corpus Inscriptionum Insularum Celticarum (1945). It is also important to recognise the work done by Jost Gippert in digitizing colour slides of many of the Ogham inscriptions in his on-line project: Thesaurus Indogermanischer Text- und Sprachmaterialien. Some of the latter have been reproduced in a most useful CD ROM produced by Fios Feasa (2002), with the inclusion of some additional photographs. The Celtic Inscribed Stones Project (CISP) also includes many of the Ogham stones in its on-line database. 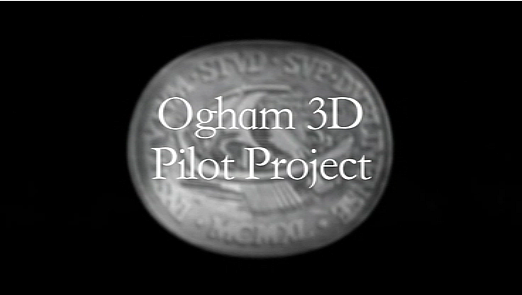 The Ogham in 3D project focuses exclusively on Ogham stones, bringing all of the available information together in a single searchable archive and adding a crucial new dimension to the work already carried out in the form of 3D models of the stones.